The suspects and solutions are as diverse as the viewpoints of physicians and coders. The health care system is awash in clinical documentation, both paper and electronic (sometimes a hybrid of the two), from physician and nurse notes to transcribed dictation and more. To put it simply, health care documentation is created by any person who documents within the health record, says Tammy Combs, RN, MSN, CCS, CCDS, CDIP, director of HIM practice excellence at AHIMA. When documentation is accurate and complete, it works wonders at telling a patient's story and can even improve patient care. "That story is used in many forums, with the most important being physician-to-physician communication," says Gina Stewart, RN, BSN, CCS, CCDS, a clinical documentation improvement (CDI) practice director and senior consultant at e4 Services. "The documentation in the medical record needs to be complete and accurate to facilitate effective continuum of care." However, no person or process is perfect. It turns out various factors play a part in the creation of "poor documentation," including compliance concerns and time constraints. Provider education seems to be another big piece of the puzzle. On the plus side, that's a problem with a fairly straightforward solution. Before tackling a documentation problem, health care organizations must elucidate whether indeed there is a problem in the first place. Determining the specifics of what constitutes poor documentation is the first step. According to Drew K. Siegel, MD, CCDS, CPC, a CDI specialist at MedPartners HIM, documentation quality depends on who is using a particular health record—and for what means. For physicians, documentation that impairs patient evaluation and/or treatment would receive poor marks. For a coder, "poor documentation would be defined as documentation that lacks the sufficient specificity to assign accurate diagnosis and procedure codes," Siegel says. In general, Stewart says poor documentation is defined as that which is lacking clarity, specificity, or completeness, and is of overall poor quality. "Documentation that fails to concisely convey a patient's problem and the logic used to address that problem risks patient safety and obfuscates any effort to estimate the quality of the rendered care," says James L. Whiteside, MD, MA, FACOG, FACS, residency program director and an associate professor of obstetrics and gynecology at the University of Cincinnati College of Medicine. "Failing to estimate the quality of the rendered care makes estimating the care value impossible, given value is defined as the quotient of care outcomes and care cost." In essence, poor documentation is anything that inhibits a clear presentation of a patient's story, Combs says. "For instance, if a provider is documenting congestive heart failure, he or she will need to include the acuity and type of congestive heart failure to ensure the highest level of specificity," she says. "Instead of just documenting congestive heart failure, which is unspecified, he or she could document acute on chronic systolic congestive heart failure, which would take the diagnosis to the highest level of specificity. All other notes should reflect care and treatment to support the acute on chronic systolic congestive heart failure." While that may seem like a minor issue of semantics to those outside—and even some inside—the health care system, its potential ramifications are real and significant. "The ramifications of poor documentation are endless," Stewart says. "They start at the front line and, most importantly, with patient safety issues. From there, the opportunities flow into financial repercussions for the facility. The consequences of poor documentation all come full circle." Combs says the consequences extend beyond quality reporting and appropriate reimbursement. "High-quality clinical documentation is not only important to obtain appropriate reimbursement and accurate quality scores but it is also an obligation to provide accurate information to patients," she says. "Patients rely on reporting agencies to make health care decisions. For patients to make informed decisions, there must be accurate information available for them to review." • unclear communication between consultants and referring physicians, resulting in a lack of follow through with evaluation and treatment plans. There is no one factor that alone causes lackluster documentation, but many CDI experts cite insufficient provider education near the top of the list. "Providers typically do not understand all facets of the health care industry," Stewart says. "They are also extremely busy, so it is very difficult to provide thorough education. It needs to be understood that physicians are adult learners; therefore, a modified approach needs to be taken when it comes to educating them." Combs agrees: "The most common cause of poor documentation is a lack of understanding of the specific information that needs to be included for coding purposes. Physicians tend to document a lot of information; however, due to a lack of education, they do not use the words needed to provide the highest level of specificity." It's important to note that proper documentation isn't going to be learned on the job or by happenstance. "When querying a physician regarding the medical record, you will never obtain positive results in the long run if you do not educate them on the eventual outcome and purpose behind the initiative," Stewart says. Provider know-how isn't the only factor at play. Time also appears to be against providers. "I believe that the amount of patients that a provider—particularly a physician—is required to see in a day leads to a tug of war," says Denise Buckland, RN, senior vice president of operations and vice president of clinical programs at the International Medical Group. "The provider's first feeling is of obligation to the patient. They spend their limited amount of time providing the patient care, and the documentation becomes the secondary priority." But there's got to be more to it, Whiteside says. "The average US physician visit is around 15 minutes. In Japan, the average physician visit is between 3.5 and 4.5 minutes," he notes. "More physician time could help the documentation problem, but this ignores the reality that there are poor incentives for clinicians to provide great documentation and there are poor systems to overcome that bias." 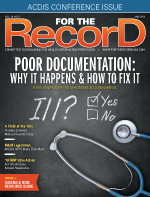 Whiteside says EHRs attempt to promote better documentation, but the effect is mixed at best. "The HITECH Act did much to force better documentation via wider adoption of EHRs, but getting physicians to fundamentally change how they process clinical information is more than just providing an electronic format that may only perpetuate bad habits," he says. EHRs have solved many legibility concerns, and even improved communication among providers. But the technology has also led to major concerns about copying and pasting within medical records. "Copy and paste has become so rampant that nearly any inpatient record of any patient in nearly any hospital is bloated with the same assessment and plan reiterated across time and which, beyond being sloppy, may impair original thinking," Whiteside says. According to Siegel, EHRs have the capability of improving documentation in the long term—if certain boxes are checked first. Specifically, he says, it's necessary for software vendors to work closely with users—both clinicians and coders—to make meaningful adjustments. There also are compliance concerns, which, according to Combs, are always at the forefront of health care organizations' thought processes. As they should be, Siegel says—to an extent at least. Value-based purchasing and other reimbursement issues (such as audits), patient safety indicators, and hospital-acquired conditions are dependent on accurate documentation. But if physicians are documenting as they should, Siegel says there's little to worry about. "Malpractice considerations are important, but if the medical record accurately portrays the patient's condition and describes how evaluation and treatment decisions were made, then documentation is sufficient for these purposes," he says. To improve documentation, Whiteside suggests establishing provider education at the classroom level. "Medical education has to change how clinical decision-making is taught," he says, adding that HIT must be better integrated into that teaching so that would-be physicians learn what does and does not work. "For hospitals, this effort has to work concurrently with existing practice, since clinical medicine cannot stop, retool, and start up again." It takes investing in more than just HIT, Whiteside notes. "Possessing a well-staffed, dedicated team of physicians savvy in IT and medicine who can work among physicians too busy or disinterested to take on the task of tooling the EMR to perform better is critical," he explains. "Too often that need is not prioritized by hospitals, given it does not contribute to the hospital margin. Likewise, if these data confirm that the surgical robot renders no improvements in clinical outcomes or costs, a prized marketing effort may be threatened." For health care organizations unsure of whether their clinical documentation is falling short, Combs recommends performing a gap analysis. "By reviewing the case mix index (CMI) and seeing where you are compared to other organizations that provide the same type of services would be the first step," she says. "If the CMI is significantly lower than their peer, they either have healthier patients or the documentation does not support true acuity of their patient population." • Did the documentation logically point to the need for the procedure? • Was the procedure adequately described? • Was the care following the procedure described properly to track the outcome? When deficiencies are found, if possible, revisit the EMR to program remedies, he says. A gap analysis may be part of a wide-ranging CDI program. "The CDI team can provide ongoing record reviews and education to providers," Combs says. "Budget constraints may be an issue, so following the gap analysis will guide the development of the CDI team. The team may need to start small and grow and see where the greatest effects are." • Review patient medical records to identify incomplete documentation of diagnoses (especially secondary diagnoses). • Use compliant queries to address identified documentation improvement opportunities with the provider. • Identify potential patient safety indicators and hospital-acquired conditions and query when necessary to clarify whether or not these conditions were present on admission. • Provide education opportunities to clinicians. "This education should include explaining that accurate and complete documentation improves patient care and impacts their profile on outlets such as Healthgrades, Consumer Reports, the Centers for Medicare & Medicaid Services, and insurance providers," Siegel says. "It should also explain the importance of capturing diagnoses that impact severity of illness and risk of mortality assignments that profiling organizations use to compare the quality of care provided by hospitals and physicians." According to Stewart, successful CDI programs are driven by the overall quality of the documentation, an approach that puts to rest the idea that the facility is "just looking for money" and facilitates physician buy-in. "When CDI staff are well versed in not just complications and comorbidities (CCs) or major CCs but also severity of illness and risk of mortality, it provides motivation to the physician to understand the goals and work with the organization to achieve better documentation. They realize that the initiative also benefits them." Physician buy-in is a must, Siegel says. "It is imperative that physicians and other clinical administrators be included in any plans made to address and correct these issues," he says. CDI efforts are no easy win, however, and can come with challenges of their own. The initiatives, and CDI staff, that show flexibility are more likely to win the day. "For example, if there are limited resources available when developing a CDI program, the organization may want to focus on one payer group, such as Medicare, at first," Combs says. "As they see success in the quality reporting for that group, they can move on to others in the organization." If resources are limited, Siegel says a mindset reset for administrators may be all that's needed. "Administrators must understand that successful documentation improvement programs and accurate coding will often result in higher reimbursement and thus improve resource limitations in the long term," he says. "Administrators must support and adequately fund and staff CDI and coding departments from the outset to achieve maximum results." It may take more resources than an organization would prefer, but it's an effort, if done correctly, that can pay off many times over, Whiteside says. "This is an expensive effort, and for much of that effort it's not clearly known how it should be done best," he says. "The mess, however, has been perpetuated long enough. Develop the expertise among physicians in training to have the workforce necessary to meaningfully turn things around. For existing hospitals, start small and have the courage to respectfully share the findings of the quality improvement cycle [with physicians]. Competitiveness can be a powerful motivator for physicians to change, and in many cases the problems are unknown to the physicians given that they have not been held to any standard in the past."